Ok, so bags. I can't stop making them. Possibly in some kind of endless quest to make the perfect one. I'm not sure. But this is my latest design and I'm kind of excited about it. I'm calling it the Sweethaven bag (I love the movie Popeye.. especially the soundtrack by Harry Nilsson). The idea is that you're out and about, you have all this stuff that you want to have with you, and this bag looks after everything and makes you feel like you have a little comforting haven of organization as you go. 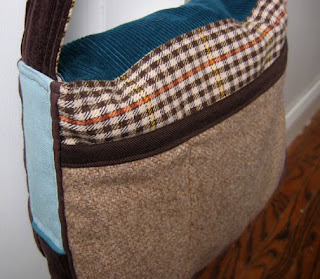 There are two large interior pockets on each side that go the whole width of the bag. I divided the pockets so that they are just the right size to fit sunglasses, a pen, a water bottle etc. Then the back of the bag also has a large pocket that could hold a paperback book. 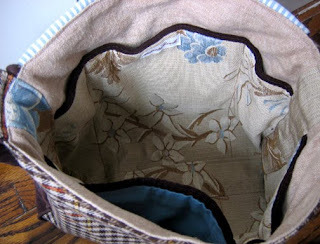 And with upholstery weight fabric, piping and top-stitching the bag has a lot of structure. All the pockets are lined which gives it even more layers. 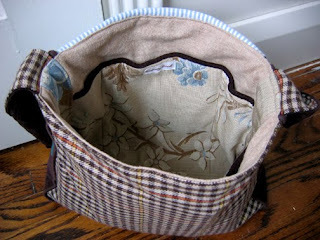 I used a wool plaid on the front and back, and the back pocket is tweedy brown wool. The sides have a blue panel, then piping, then brown corduroy on the bottom and outside of the straps. The front is dark teal/turquoise corduroy with an appliqued doily. Look at all the detail on the doily! I love the pineapple motif. Vintage doilies kind of fascinate me. Someone spent ages making it, and no one really wants them these days to actually put under vases or whatever. But I love the lacy look and buy them because they're pretty. So now I'd like to ask, what do you look for in a bag? 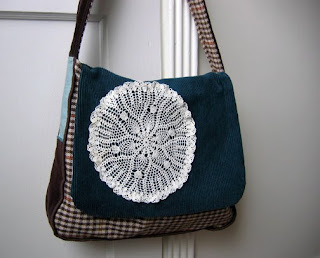 Oh my I love the doily on the bag. 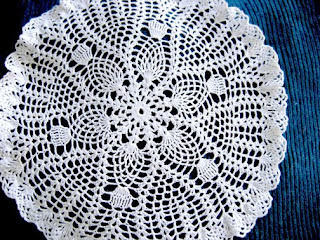 I have some Doilies that my great great aunt crocheted. I've been meaning to stitch them on to pillows or something... but I think they have found a new home now. Oh, wow. All those pockets are a fantastic idea! Love the fabrics you used. I think my perfect bag has a more structured shape and pockets are definitely a plus. Otherwise (or in addition to) you must use lots of pouches to keep things together. Oh I love the construction of your bag!! The fact that it is a messenger bag is a super plus!! I am doing the Project 365 on Flickr, so I have been looking up and down for a well constructed bag that's large enough to carry and protect my DSLR… and everything else I carry with me everyday.